Club Penguin Cheats by Mimo777 Club Penguin Cheats by Mimo777: Club Penguin Spooky Music Update! Do you have a favorite new iggie song? AARrrgh i have'nt got'em yet! what to do ? my list isnt updated. Im sad. I have a glitch. When you play Jet Pack Adventure and you crash, you try to exit the game, but your connection will be lost!! Hi Mimo,its Redflameman here. I don't know if you remember me but I used to be a moderator here when moderators existed. Slowly I feel like I am being pulled away from Club Penguin. Getting less and less active there. I wish I could equally keep up with all the sites I go on but its very hard. I have been watching your posts for more then 4 years. Your almost the main reason you kept me playing Club Penguin. I would just like to thank you for keeping this blog going no matter what. I will try to start commenting here more! I will try to get more active on Club Penguin too. 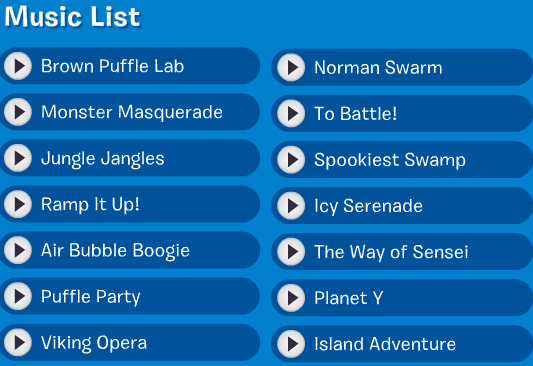 And have you heard about the Puffle Launch app on the iPod Touch? I got it a few weeks ago and its very fun! Hey mimo, I dont play cp anymore, But I play a game called Minecraft. You should start playing it it gets really addicting but really fun! My list isn't updated either. I remember you before I knew how to post comments! You had really cool comments like this one! Look at the CP youtube channel. There is a new video and the dude (I think his name is Leo or Liam or something) says that in order to get the Frankenpenguin and pharoh puffle hats, you need to buy the plush versions of them. There is also another plush puffle with a snowflake helmet that you can only get at Target, which of course gets a snowflake helmet for your online puffle. Bye! can you ask me a question so i can become a mod plz!